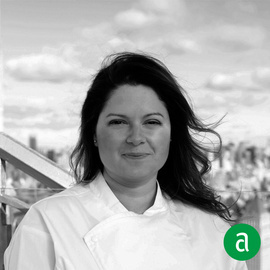 Renata Ameni, Executive Pastry Chef of Crown Shy in New York, shares her career timeline and words of advice for up-and-coming professionals. My first kitchen job in São Paulo made a tremendous impact on my life and career. Chef Fabrice Le Nud, was French and very old-school. In other words, he was hard on us. However, the kitchen fundamentals he instilled in the team shaped my career. In order to become a chef, Le Nud insisted, you need to be able to do every kitchen task, no matter how small. Foregoing prep was not an option: every senior member of the kitchen team must be able to perform every task. Understanding the fundamentals and proving myself when I was young and impressionable was invaluable— especially as a woman. When I’m hiring, I look for people who are humble. I have no interest in candidates who think they know everything. I want people who are open to learning and know that there is an infinite amount to learn. In terms of practical skills, I look for attention to detail, organization, and ability to prioritize tasks effectively. I try not to micromanage my teams. I’m specific about what I need, then I let people make their own mistakes. When someone makes a mistake, they never make it again. In turn, I’m not afraid to point out when something is done wrong or sharing words of affirmation when people execute well. I like to tell people when they’re crushing it. When I add dishes to a menu, I want them to be interesting for both my team and the guests. That often means a dish will incorporate a new technique or an unfamiliar flavor. It’s a good way to make sure our cooks are consistently learning. I can’t live without my team. I’m not a solo act. The most essential books for me are "On Food and Cooking: The Science and Lore of the Kitchen" by Harold McGee, "Baking & Pastry: Mastering the Art and Craft" from The Culinary Institute of America, and "The Cook’s Illustrated Cookbook" from America’s Test Kitchen.